Despite the apparent jokes about scrapple-flavored doughnuts, Delaware has it going on when it comes to top doughnut shops. From traditional yeast-raised doughnuts to whacked out flavors and build-your-own, the First State offers a bevy of beautiful pastries just for you. Get Polish pastries, Dutch doughnuts, online offerings, fritters, fresh-brewed coffee, and more. So get your sweet tooth on, and come with us as we count down our 10 best doughnut shops in Delaware. Established in 2015, Duck Donuts are purveyors of warm, delicious, made-to-order doughnuts. The novelty of a fresh, warm doughnut paired with a piping hot, delicious cup of coffee is undoubtedly popular with locals and visitors alike, but the origin of the Duck actually has its roots in North Carolina. Nevertheless, you can build your own delicious doughnut by choosing an icing, topping, and drizzle or choose from one of their specials, like maple icing with chopped bacon. With a similar setup and mindset as Duck Donuts, the Fractured Prune is a little heavier on the quirk. 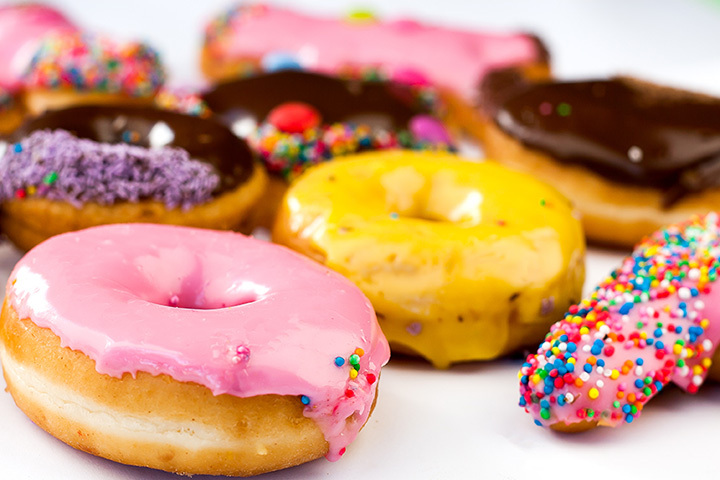 Create-your-own doughnuts using a variety of glazes and toppings. Choose from a mind-boggling assortment of preconceived doughnut flavors or build your own from 19 glazes and 13 topping. Either way, know the doughnuts and topping are made fresh daily, like the black forest, the blueberry hill, or the margarita. Established in 2015, this spot proves once again that great food often comes out of food trucks. Every doughnut served at Sandy Pony Donuts is made hot and fresh to your order, exactly the way you want it. Try one of their 24 unique flavor combinations—Porky Pony (bacon, cinnamon-sugar, and honey glaze), salted caramel (caramel glaze and pretzels), Dirty Banana (banana glaze and Oreo crumble)—from this Chincoteague Island-born company. Another take on the hot, hand-made doughnut topped with your choice of glazes and drizzles has its roots right here in the First State. Started in 2015, and now shipping nation-wide, you can also order these doughnuts online. Create your own combo or pick from the classics, like Baby Ruth, chocolate-covered pretzels, and vanilla nut. Opened in 2012, this hometown favorite offers fresh New York-style bagels homemade hot, fresh, buttermilk doughnuts served until noon. Laurel is essentially a quintessential small-town breakfast shop and deli located in historic downtown Laurel. You will find a full breakfast menu with hefty portions, coffee, lattes, cappuccinos, espressos, and Hershey’s ice cream. This Bake Shoppe specializes in traditional yeast-raised doughnuts in glazed, Boston cream, chocolate, vanilla, maple, and more. You will also find apple fritters, Polish babkas, pastries, pies, cakes, Danishes, cinnamon buns, turnovers, and much more. If you wanted to go to breakfast baked-good heaven, this is surely where you would end up. This is Dutch cooking at its finest, and you will only find it at the Dutch Country Farmers Market, open three days a week. You will find the freshest, most tender cakes, pies, bread, doughnuts, cookies, bagels sticky buns, cinnamon rolls, and more. Pair a fresh, Dutch doughnut with some of their freshly-brewed coffee from their own roasted beans, and you’ll wonder if you’ve stepped outside Delaware and gone somewhere more magical. Get hot, hand-dipped bagels and doughnuts within feet of where they are made. Dorman’s is a hole-in-the-wall diner, and you can tell many of the customers are regulars because has a distinctly local feel to it. This bake shop also offers sticky buns, freshly baked pastries, cakes, and cupcakes. Since 1957, Sweeney’s has been baking up the sweet stuff. Family-owned and operated, everything is made fresh on premises daily and sell out quickly. Get cakes, pastries, balloons, doughnuts, and ice cream. From bread to rolls to Danishes, everything is made the old-fashioned way by hand, so just give them a 24-hour heads up and bring home fresh-baked goodness. Opened in 1952, Serpe suffered a devastating Christmas Eve fire in 2015. But you can’t keep a good bakery down, and Serpe’s is back and better than ever. Offering Italian pastries, custom cakes, bread, doughnuts, and more, you can taste the care and tradition in every bite of their tender yeast doughnuts. And for everything else Italian, there’s only one place to go in Delaware.